It’s an often-overlooked enclave with the largest concentration of Federal and Greek Revival style houses in New York City. Its origins can be traced back to historical figures as esteemed as George Washington, John Adams, Alexander Hamilton, and John Jacob Astor, but it’s just as deeply connected to Italian immigrants and radical 20th-century innovators. The most dyed-in-the-wool New Yorker will have trouble telling you if it’s in Greenwich Village, SoHo, or Hudson Square. The tiny Charlton-King-VanDam neighborhood is, as its name would imply, located along charming Charlton, King, and VanDam Streets between Sixth Avenue and Varick Streets, with a little arm extending up the southernmost block of MacDougal Street just below Houston Street. It was only the fourth designated historic district in New York City when it was landmarked on August 16th, 1966, and for good reason. The area was once the home of Richmond Hill, one of Manhattan’s most imposing mansions, built in 1767 by Major Mortier. That grand home was located on a 400-foot-high hill, “surrounded by gardens, meadows and woods, all with an impressive view of the Hudson” according to the Landmarks Preservation Commission. The mansion quickly became famous for more than just its grandeur when it was used by George Washington as his New York headquarters during the Revolutionary War. After the war, when New York City was briefly the nation’s capitol, Richmond Hill became the Vice-Presidential mansion and home of John Adams. 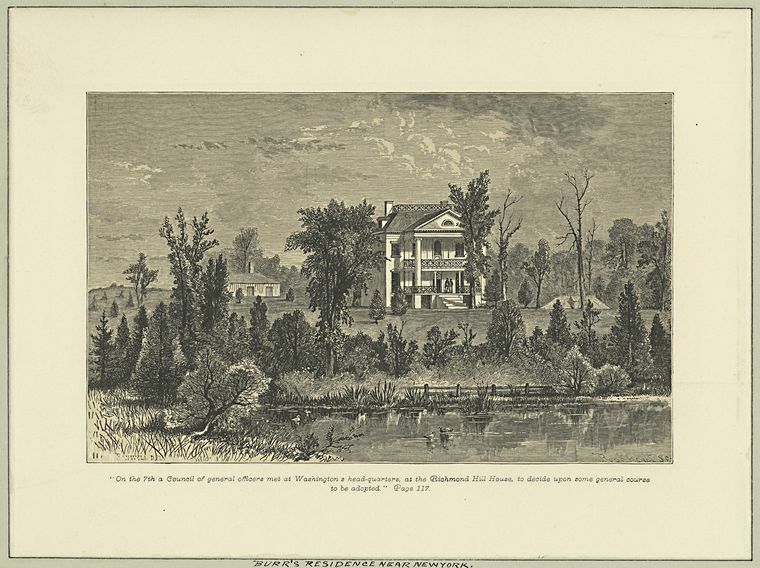 After the capitol was moved, Aaron Burr (who would eventually succeed Adams as the country’s third Vice-President) bought the mansion and made it his private home, using it for lavish parties and social gatherings. As New York grew northward from the tip of Manhattan, Burr saw the writing on the wall that his country estate’s days were likely numbered, and that there was money to be made in developing the land. In 1797 he mapped the property, dividing it into lots and laying out the three streets from which the neighborhood would eventually take its name. But Burr left the property undeveloped, even as he followed his President, Thomas Jefferson, to the nation’s new capitol, Washington D.C., in 1801. Of course in 1804, in the final year of his single term as Vice-President, Burr challenged Alexander Hamilton to a duel, shooting and killing him. The scandal ended Burr’s political career and led to his fleeing New York. He soon sold the newly mapped Richmond Hill Estate to John Jacob Astor. Astor rolled the mansion down the hill to the corner of Charlton and Varick Streets, where it remained and functioned as a theater for many years. The hill upon which the mansion was located and from which it took its name was leveled, the streets were laid out, and soon after starting in the early 1820s development of rowhouses on the former estate began. An incredibly high percentage of those houses from this first wave of development, which lasted until 1829, all in the Federal style, survive to this day. Several houses in the district were lost to early fires and replaced with Greek Revival houses in the 1830s and early 40s; most of those also survive today. In the 1880s and 90s as waves of immigrants washed over Lower Manhattan, a small number of the houses were replaced with tenements. 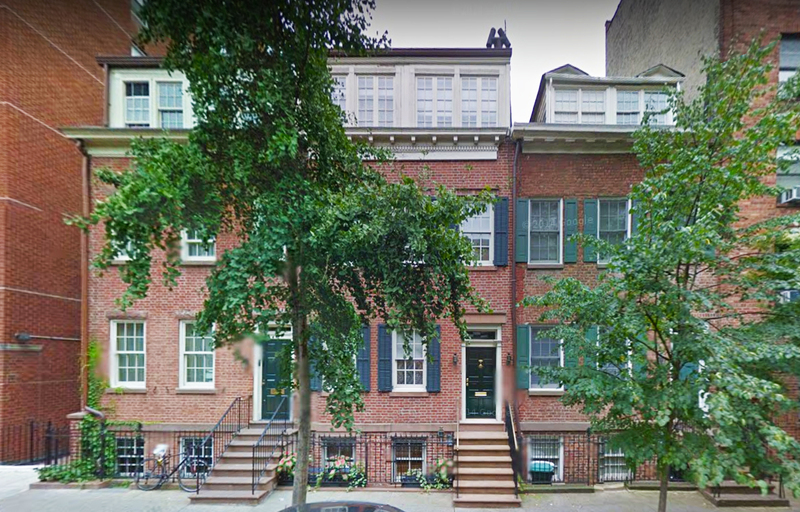 But compared to almost every other nearby section of Manhattan, this occurred here to a remarkably small degree, with most of the houses remaining intact. Perhaps even more remarkably, as entire blocks of similar houses were destroyed along the streets (including Charlton, King, and VanDam themselves) to the west and south of here to make way for factories in the late 19th and early 20th centuries, these houses survived. 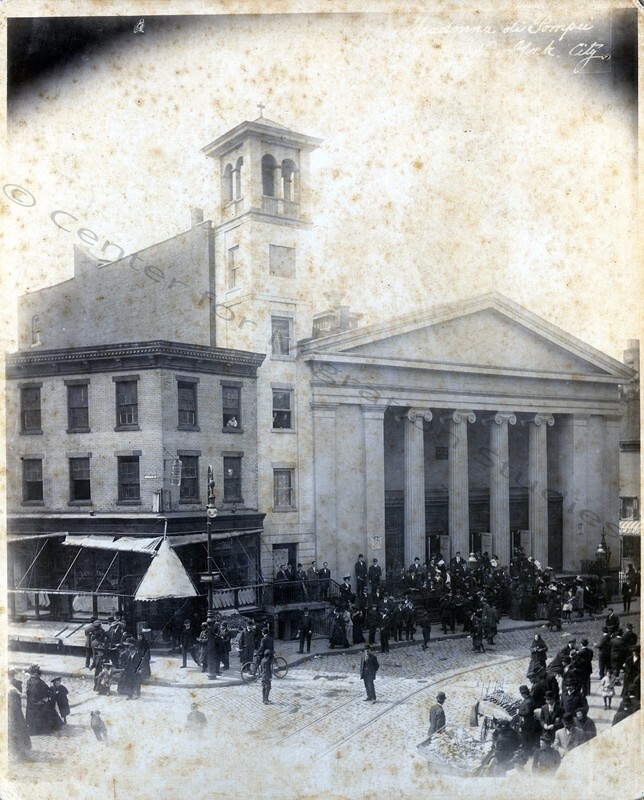 This is perhaps because most remained in private hands, while virtually the entire neighborhood to the west and south, now known as Hudson Square, was (and still is) owned by Trinity Church. Trinity, perturbed by an 1894 lawsuit by the Health Department of the City of New York over deplorable conditions in the housing it owned and operated, decided to all at once get out of the business of providing homes for people. It razed all its housing for commercial and manufacturing buildings, which came with fewer obligations. Until a 2013 rezoning of Hudson Square which allowed residential development, the Charlton-King-VanDam district remained a tiny oasis of residential life within a commercial/industrial desert south of Houston Street and west of Sixth Avenue. Our Lady of Pompeii Church in 1909. Via the GVSHP Archive, © Center for Migration Studies of New York. 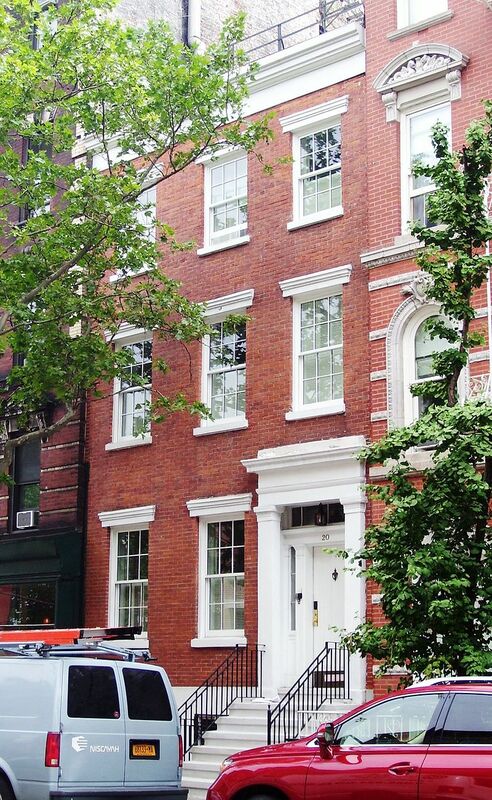 While never as saturated with immigrants as neighboring Greenwich Village to the north or the South Village to the east, Charlton-King-VanDam nevertheless housed its share of new arrivals to this country and their families in the late 19th and early 20th centuries. This was particularly true of immigrants from Italy, many of whom attended nearby Our Lady of Pompei Church on Bleecker Street and St. Anthony of Padua Church on Sullivan Street. 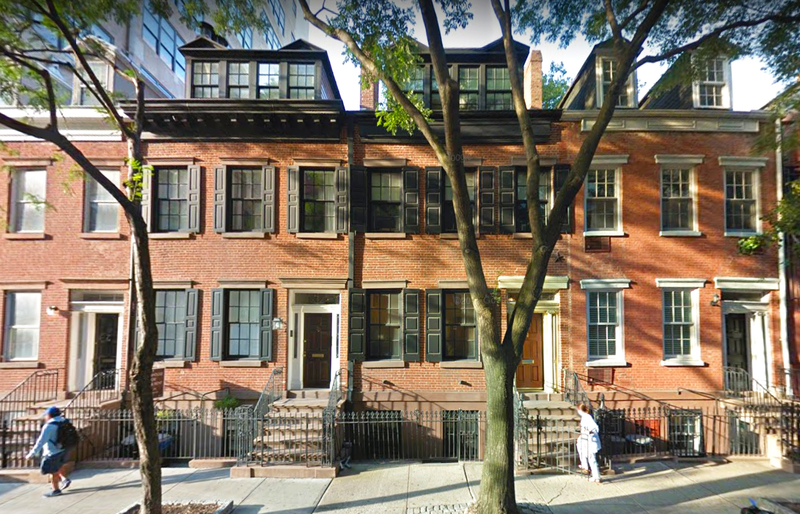 In the 20th century, Charlton-King-VanDam’s charming houses began attracting more bohemian residents, particularly those in theater and music, who appreciated its increasingly anachronistic character. It also drew education innovator Elisabeth Irwin, who in 1921 founded the Little Red Schoolhouse, considered the first progressive school in New York City, just a few blocks away on Bleecker Street. The school’s ethos of fostering creativity and individualized learning was geared towards both the bohemian and immigrant residents of the neighborhood, many of whom embraced it. Irwin, who was openly lesbian, was a radical figure in her day. 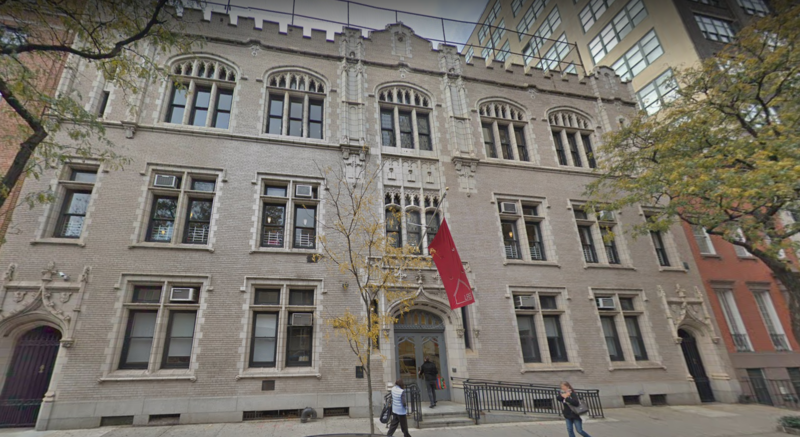 Just a year before her death in 1941, Little Red Schoolhouse founded a high school at 40 Charlton Street. Now known as the Elisabeth Irwin High School, it continues to operate at that location to this day. By the late 20th and early 21st centuries, the neighborhoods surrounding Charlton-King-VanDam, including Greenwich Village and SoHo, were becoming among the city’s most desirable and expensive. Even the low-key backwater of Hudson Square has, as a result of the 2013 rezoning, become a boomtown of new high-end residential and office development. Charlton-King-VanDam has followed as housing prices here have risen sharply, and its charming homes are increasingly sought-after. But owing to the 1966 landmark protections and a devoted population of homeowners, the area has probably changed less than any of its neighbors. While meticulously restored and cared for, the houses remain simple in design and modest in dimension and still harken back to a time when New York was just beginning its long run as an ambitious but young metropolis.